The Cubs won a series! Obviously the Victor Caratini injury casts a modest pall over the win, but, if we step back, it’s still a very nice thing. That’s three wins in their last five games! That’s a .600 winning percentage! Incredible! We’ll have more on Jose Quintana’s brilliant start in a bit, but I do want to that it had to be right up there among his best starts with the Cubs. There was the dominant one against the Orioles to start his time with the team, and then a couple crazy good ones against the Brewers. But 7.0 innings, 0 R, 4 H, 1 BB, and 11 K? That’s nuts. And although the generous strike zone helped, he also got a whopping 15 swings and misses (including four on the changeup he’s trying to bring back this year, and is so critical to his success). It was such a good, good, good, needed start. 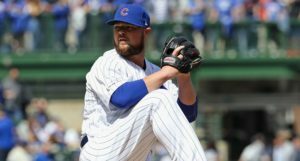 And then the Cubs got a chance to do something they haven’t done all year: have a normal couple innings from the back-end relievers to close out the game and get a save. 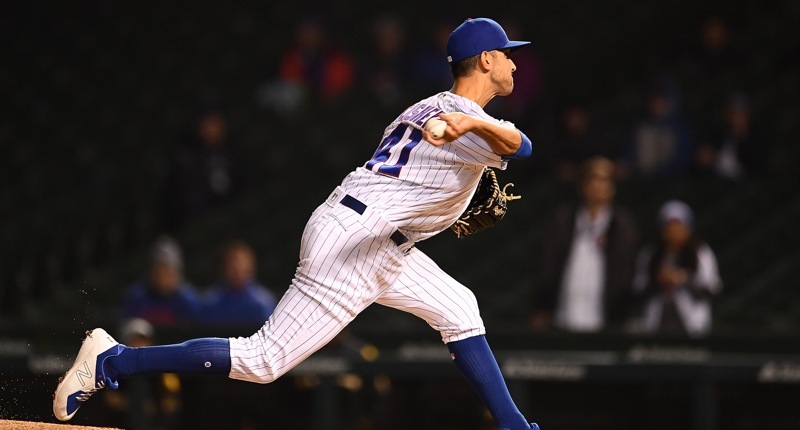 Steve Cishek and Pedro Strop did it, meaning the bullpen is now up to 17.2 straight scoreless innings. Regression cuts both ways. The bullpen ERA is SO close to … getting under 6.00. Steve Cishek with the UNREAL fastball. 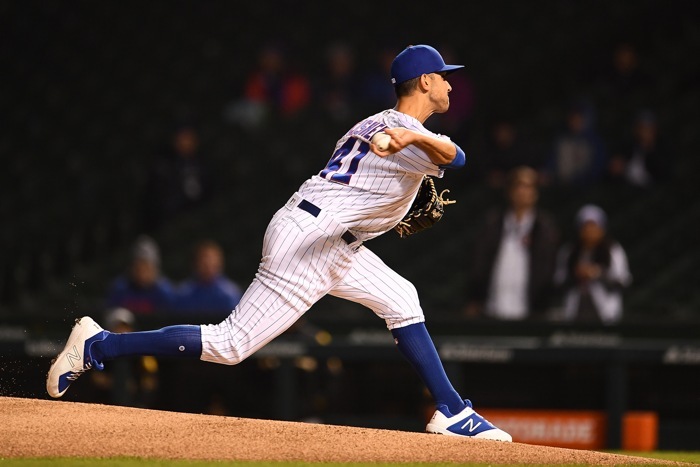 When Cishek is at his best, his sinker does that, but his slider – coming in at a range of speeds, but at the same arm angle – breaks in exactly the opposite direction. Which is to say, if you’re left to guess, you’ve got a 50% chance of looking unbelievably foolish. 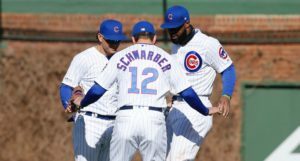 In the 7th inning last night, Kyle Schwarber grounded out to second base, which was cause for celebration. Why? He’d otherwise struck out in six straight at bats, all swinging. 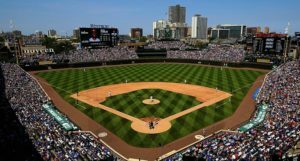 Maddon thinks Almora looks fine – his swing, his approach, etc. – and doesn’t really want to see Almora changing anything right now. I guess we’ll see. Also in that article, you can see Joe Maddon’s belief that Tyler Chatwood could go upwards of 75 pitches in his spot start on Sunday. At max Chatwood efficiency, that might be enough to get through four innings. 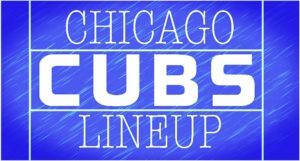 Although he threw a successful bullpen yesterday, apparently Mike Montgomery is “probably not likely” be activated from the IL when he’s first eligible on Monday (Cubs.com). Montgomery, who struggled mightily to open the season, is working through a mild lat strain. Sanderson pitched for the Cubs from 1984 to 1989. Bryan has your minor league notes here. Baseball America had to take down all of its minor league baseball videos at the request of MiLB, which is in the process of reorganizing its distribution of highlights. Here’s hoping they are able to work something out in this process, because if anyone should be able to analyze and share minor league clips for the purpose of benefiting the long-term growth of the sport, it’s a place like Baseball America. It’s a 25% off flash sale day at the Cubs shop, so check it out and treatyoself! Previous PostPrevious post:Sponsored: 25% Off ALL ORDERS Today Only at the MLB Shop!